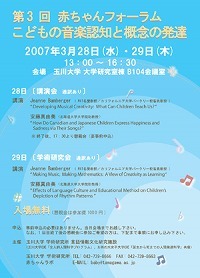 "Developing Musical Creativity : What Can Children Teach Us?" "How Do Canadian and Japanese Children Express Happiness and Sadness via Their Songs?" "Making Music, Making Mathematics: A View of Creativity as Learning&quot"
"Effects of Language Culture and Educational Method on Children's Depiction of Rhythm Patterns"